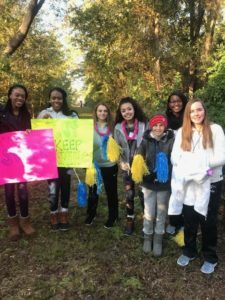 Junior League of Columbia’s Junior Volunteers (JV) program, created to promote voluntarism among youth in the community, is designed for young ladies in grades seven through twelve. 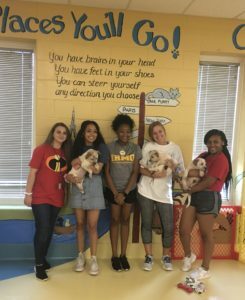 This year, JLC has 42 Junior Volunteers, and they have been quite busy! In December, Junior Volunteers enjoyed a holiday celebration, went caroling and adopted a family of four through Families Helping Families. 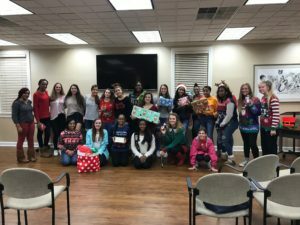 In January, these young women were recognized at JLC’s January General Membership Meeting, which gave them an inside look into the business operations of the League and an overview of the organization. Junior Volunteers are required to participate in at least three volunteer opportunities each year, which include a Pawmetto Lifeline tour and donation drop-off, hosting a Girls on the Run motivation station, facilitating a Valentine’s Day cookie decorating party at Epworth Children’s Home, helping organize and pack gift boxes at the Salvation Army Christmas Warehouse, and more! Those interested in learning more about the Junior Volunteers program should visit the JV landing page on the JLC website, where requirements and an application form can be found. 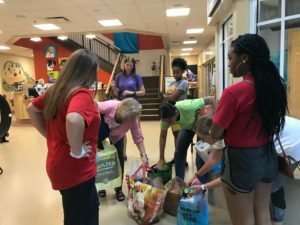 Way to go, Junior Volunteers! And a big thanks to Junior Volunteers Committee chair, Meredith Ward, for a wonderful start to the League year!